This year’s Expo in Astana is the single largest international event of the year, equivalent to the Olympics. And Kazakhstan is the event’s first gold medal winner. One thing has become apparent over the last several years: Kazakhstan is where important things get done. Whether it’s through hosting negotiations regarding Iran’s nuclear program, or by becoming the center of the Syrian peace talks, the largest Central Asian nation is quickly becoming a global hub where big things happen. This summer, Kazakhstan is hosting perhaps its most important event to date: the 2017 Expo in Astana. This marks the first time in history that a Central Asian nation will host the Expo World’s Fair. Centered on the ever-timely theme of “Future Energy”, this year’s Expo in Astana will host over 100 countries at the highest levels. Each nation will be sharing with the over five million expected visitors their respective innovative approaches to developing groundbreaking technology for vaulting mankind’s energy production forward and their own national stories of progress. Simply put, the Expo will be the single largest international event this year. No global event in 2017 even comes close in either magnitude or importance. There are no Olympics, no World Cup. What’s bringing the world together this year is Expo 2017 in Astana. For 2017, the Expo is the equivalent of the Olympics, and by hosting this incredibly important soft-power event, Kazakhstan is the first gold medal winner. Hosting the 2017 Expo in Astana is but one of many recent successes Kazakhstan has had in raising its international profile as a global leader in peace, security, transnational cooperation, and worldwide economic growth. Syrian peace talks are ongoing in Kazakhstan, which was chosen to host the talks due to its respected status amongst all involved parties and its pivotal geostrategic position in the center of Eurasia. These talks now make Astana the center of the most important and intractable current diplomatic challenge in the world. In addition to its importance as a diplomatic advocate, Kazakhstan is quickly rising as a player in global security issues. Late last year, Kazakhstan made history by becoming the first Central Asian nation to ascend to the non-permanent United Nations Security Council. In this new role, Kazakhstan, and by extension, Central Asia, finally has a seat at the table on international security and a voice on transnational issues for the next two years. 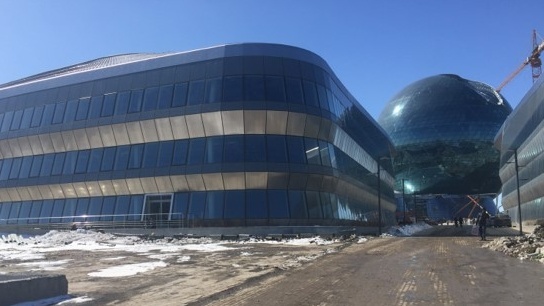 Now, Kazakhstan is continuing the momentum of these “hard power” successes on the global stage by opening its doors to the world this summer for Expo 2017. From D.C. to Beijing, Moscow to Tokyo, Tel Aviv to New Delhi, Dubai to Ankara, Kazakhstan is experiencing a wave of interest and engagement from those who have realized the magnitude of its potential. I’m confident the World’s Fair will cement the Central Asian nation as a place that energy innovation is driven, diplomatic ties are forged, and economic progress is grown far beyond the World EXPO 2017.